30 September 2014. The biotechnology company Alios BioPharma Inc., a developer of anti-viral medications, is being acquired by health care products enterprise Johnson & Johnson for $1.75 billion. The all-cash deal will add Alios BioPharma’s pipeline to the portfolio of Janssen Pharmaceuticals, a division of Johnson & Johnson. Alios BioPharma, in South San Francisco, California, develops therapies for viral diseases from its library of nucleoside analogs, compounds designed to act like derivatives of nucleic acids that block the assembly of genetic molecules, thus preventing the replication of the virus. Nucleoside analogs are the basis of therapies for a range of diseases including various types of cancer and bacterial infections, as well as viral infections. 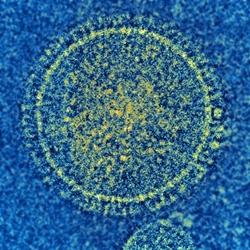 The company’s lead candidate, code-named AL-8176, is a nucleoside analog treatment for respiratory syncytial virus, or RSV, that infects lungs and breathing passages, for which there is not yet a cure. Among children under 1 year of age, RSV is the most common cause of bronchiolitis — inflammation of small airways in the lungs — and pneumonia. Centers for Disease Control and Prevention says between 75,000 and 125,000 children in the U.S. are hospitalized for RSV each year. In July, Alios BioPharma released initial results of an intermediate-stage clinical trial of AL-8176, where healthy volunteers were infected with RSV, then treated with one of 3 dose levels of AL-8176 or a placebo for 5 days. The company says the trial met its primary objective of lower viral loads among the infected patients taking AL-8176 compared to the placebo. By day 12, none of the patients treated with AL-8176 had detectable RNA from the RSV virus in their systems, while RNA was still evident in the patients receiving the placebos. Alios is recruiting participants for a trial of AL-8176 among infants hospitalized with RSV, at sites outside the U.S. The company is also developing therapies for the common-cold virus (rhinovirus), influenza, and hepatitis C.
Janssen Pharmaceuticals, a division of Johnson & Johnson, is expected to add the Alios pipeline to its current research and development of treatments for infectious diseases including HIV/AIDS, hepatitis C, and tuberculosis.